For the first time in many years, the gang from the sitcom about 1950’s Milwaukee reunited on NBC’s Today Show. It was part of the morning program’s week-long “Together Again” series that reunites the cast of classic shows. 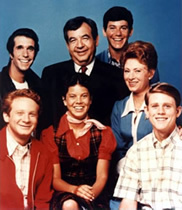 The Happy Days reunion aired on Monday and assembled original castmembers Ron Howard, Henry Winkler, Tom Bosley, Marion Ross, Erin Moran, Anson Williams, and Donny Most. During the run of the original series, the cast was well known for being a tight-knit group and that doesn’t seem to have changed. Take a look.